Over 200,000 people attended the biggest live event in the history of London’s Royal Docks on October 8 and 9, as musician Jean Michelle hosted his Destination Docklands show. The show formed part of a series of open-air spectaculars staged by the electronic music pioneer, featuring fireworks and lazers fired into the night sky. 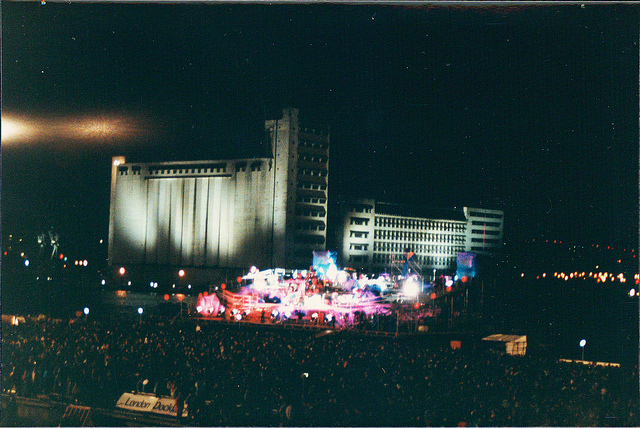 The front of the Millennium Mills building was painted white to allow huge projections to be beamed on it. The floating stage, designed to resemble a battleship, was built on top of 16 barges. During the concert, the vessel was meant to travel from one end of the Royal Victoria Dock to the other. Poor weather conditions put paid to that plan. You can watch a behind-the-scenes documentary about the staging of Destination Docklands here. Poignantly, this was also the month when the Royal Docks closed to commercial traffic, in 1981, ending many years of decline in the fortunes of the docks and the surrounding areas.